The Fortaleza Restaurant Guide is a LOCAL guide! Unlike most guides we list only the best regional Brazilian Restaurants in Fortaleza, well known, recommended and visited by those who live and work in and around Fortaleza. COLHER DE PAU (Varjota): One of the best and more traditional Brazilian restaurants in Fortaleza. The menu full of marvelous examples of Northeastern Brazilian cuisine's rich sauces colors and tastes. Carefully chosen ingredients creatively come together in the kitchen of this award winning restaurant. The regional dishes include carne de sol sliced, shredded and fried in butter with one of Ceara's most popular plates baiao de dois, pacoca and fried banana, vatapa de peixe, frango à cabidela, feijao verde, moqueca de arraia, torta de macaxeira with carne de sol and picadinho Cearense. Rua Ana Bilhar, 1178,corner Rua Frederico Borges. Tel: (085) 3267-6680. Hours: 11:00 a.m. to 12:00 a.m.
Credit Cards: Master Card, Visa, Diners, American Express. 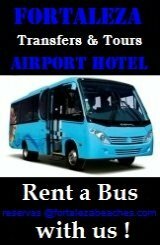 Price:R$ 35,00 to R$ 60,00 per person. Veja Magazine chose Colher De Pau for the "Best in the City 2009"
in the category, Regional Restaurants in Fortaleza. DELICIAS DO SERTAO (Maraponga): Of all the regional Brazilian restaurants in Fortaleza this is regarded as one of the best to experience both Northeastern Brazilian cuisine and dance the traditional Forro "Pe de Serra". The specialties of the house are sarrabulho, buchada, and mao de vaca. The menu includes barbecued meats and pasta dishes as well. The restaurant has been operating since 1998. Located in MONDUBIM, Av. Godofredo Maciel, 5421. Tel: (85) 3296.1323. And also ALDEOTA, Avenida Santos Dumont, 938. Tel. (85) 3231.2100. Hours: 11:00 a.m. to the last to leave. 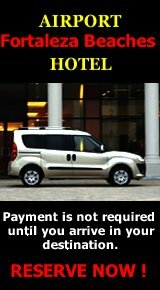 Excepts all major credit cards. 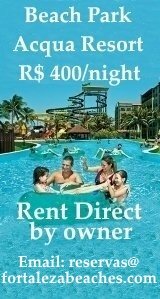 Price: Up to R$ 40,00 per person. O PAULINHO DA MARAPONGA (Maraponga): Up and running since 1968. Making it not only one of the oldest regional Brazilian restaurants in Fortaleza but some what of a landmark. Well known through out the city for great traditional northeastern dishes, a wonderful local atmosphere and good service. Some of the most popular dishes are carne de sol served with pacoca, baiao de dois and macaxeira, carne de carneiro with baiao de dois, batata doce, farofa and vinagrete. Located in MARAPONGA , Avenida. Godofredo Maciel, 3884. Tel: (85) 3296-3123. Hours: 10:00 a.m. to 11:00 p.m.
Excepts all major credit cards. 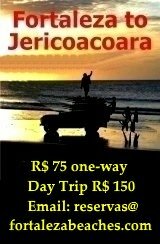 Price: Up to R$ 40,00 per person. CASA DE FARINHA (Aquiraz): A perfect place to stop and eat, either going or coming back from any of the beaches between Fortaleza and Canoa Quebrada. Alongside the restaurant there are hammocks where you can rest before getting back on the highway. Considered one of the best restaurants along CE-040. Specialty of the house is “Roast Lamb” served only on weekends and holidays. Self Service Buffet is R$ 23.90 per kilo and includes; galinha caipira, buchada, sarapatel and other northeastern Brazilian specialties. Rodovia CE-040, Km 13.5, located in Pindoba, Aquiraz. Tel: (85) 3361-2006. Hours: 11:00 a.m. to 3:00 p.m. Sat and Sun till 5:00 p.m.
Credit Cards: Master Card and Visa. Up to R$ 35,00 per person.